In the series of activating the house of the horoscope, I have reached on the 6th house. In the previous articles, the main focus was on the only one thing, how to strengthen the houses of the horoscope. 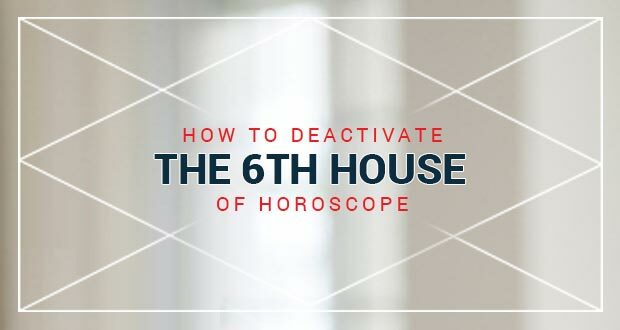 On this point, the sixth house is different from the other house of the horoscope. You have been informed the benefit of activating the houses of horoscope but it will be beneficial for you if this house (6th ) is weak. The much this house will be inauspicious, deactivated the best results you will get from the same. Because this house is the house of the enemy, competition, immune power and your competency to the fight with the diseases. It has been said that the 6thhouse of the horoscope mainly represents diseases, debt & enemy apart from the other things. You would have observed that everyone is suffering from any disease then it does not mean that the 6thhouse of his horoscope is activated. There is no doubt that everyone is having any health-related problem. In fact, this house shows the competency of your body. 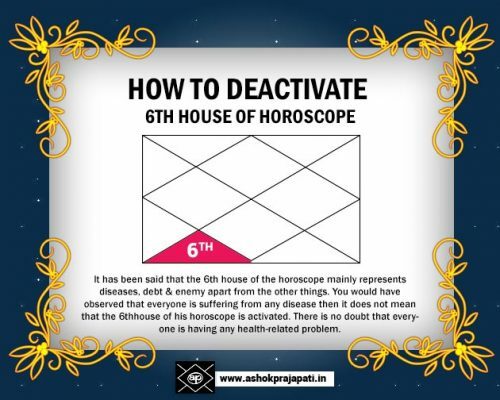 If this house is in deactivation mode then you will have no fear of diseases. You will never trap in the debt, will never have to take any loan. And the enemy, you will neither have enemy nor have enmity with anyone. This situation is like iron cuts iron. 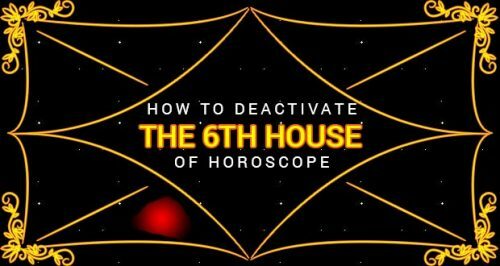 This is an inauspicious house and if inauspicious planets sit in the 6th house then they will vanish all the ill effects of this house. If this house is strong then you will be in debt. There are chances that you may suffer from diseases and you may have strong enemies. Sun:-The presence of planet Sun alone is very good. The person gets the distinction in the competition. The person will always victorious and even enemy will obey him. Though enemy will keep enmity in their heart but in front of him they will do nothing and always try to hide the enmity. Moon:-Moon in the sixth house of the horoscope makes the person weak either physically or mentally. The sixth house will be activated and increase the diseases on one side and on the other side, the enemy will be more powerful. Mars:-Mars is the symbol of the fight. The Mars in the 6th house dominate it fully but its fourth sight on the ninth house create the hindrances in your fortune. The unwanted expenditure will disturb the budget. The person may suffer from headache, tension or any other minor problem in nose, ear or head. These problems will not be of a permanent nature. Mercury:- Mercury in the 6th house activate it. The Mercury of the sixth house gives the diseases which are visible, for example – skin problem, allergy, dental problem etc. The presence of Mercury is not good in the sixth house. Jupiter:-Jupiter in the 6th house gives you the health problem which is considered diseases. The example is obesity. Though the problem created by Jupiter will not affect your business. On the debt and disease front, the Jupiter will not disturb you because its fifth sight will be on the house of business and ninth sight will be on the house of monetary saving. Finally, as per astrology, Jupiter doesn’t have any enemy so you will not have any enemy. The people may jealous with you but they will not be able to harm you. Venus:- The planet Venus with its presence in the 6th house will make it activate. It will give secret diseases and you may have the female enemy. Saturn:-I have said in the beginning that the inauspicious planets give good results in the 6th house. Saturn gives the best results in the 6th house. It affects not the only sixth house but also affects the third house of the horoscope. The enemy will be frightened of you, friends & relatives will also support you. Debt and diseases will never disturb you. Except for a small problem like gastric your immune power will be good. Rahu:-No doubt Rahu in the 6th house is considered good but it creates a sense of insecurity. Rahu is considered a shadow planet and represents the secrecy. So you will be frightened only from diseases, debt and enemy and in fact, you will never suffer from the same. Ketu:-Ketu gives the same results in the 6th house as give the Rahu. But the only difference is seen is that the Ketu makes the person addict. You may make the expenditure on useless things. No doubt, it will not create any debt but invite poverty if you don’t control yourself. Now the question arises what we should do regarding the sixth house, whether we should strengthen it by activation or weaken by deactivation. 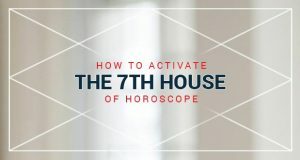 Fully activate 6th house of the horoscope will give you diseases, debt and enemy because these things are the main outcome of this house. No one wants these things. So keep one thing in mind that strong sixth house of the horoscope is of no use. In fact, we have to make the weaker sixth house of the horoscope by performing some remedy. The remedy is in shape of gemstone, Mantra & some other useful tips. To get rid of diseases worship the God Shiva and chanting the Mahamritanjya Mantra daily. To get rid of debt, worship the God Ganesha and chant any Mantra of God Ganesha. Chant the God Ganesha Mantra after worshipping on every Tuesday. Offer the sweet of Laddu to God Ganesha. You will get the positive results after 43 days and after one year you will get rid of your debt. To get the victory on enemy chant the Devi Baglamukhi Mantra. For this purpose, no Mantra is bigger and useful than Baglamukhi Mantra. This Mantra can make the weak a strong person. It starts works for the helpless from the very first day. If any person thinks that to chanting the three different Mantra is difficult when there is a solution. There is one Mantra which is a substitute for all three but I can’t explain here because to chant that mantra is very difficult and method of worship for that mantra is different and if interested then contact me.